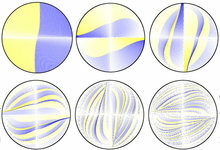 The distributions of “time of flight” (time spent by a single fluid particle between two crossings of the Poincaré section) are investigated for five different three dimensional stationary chaotic mixers. Above all, we study the large tails of those distributions and show that mainly two types of behaviors are encountered. In the case of slipping walls, as expected, we obtain an exponential decay, which, however, does not scale with the Lyapunov exponent. Using a simple model, we suggest that this decay is related to the negative eigenvalues of the fixed points of the flow. When no-slip walls are considered, as predicted by the model, the behavior is radically different, with a very large tail following a power law with an exponent close to $−3$.